On a Moto Guzzi California motorcycle, checking or changing the rear gear oil and transmission gear oil is something you can easily do yourself. I recently performed this basic maintenance task on my ’07 California Vintage. If you haven’t tried to do this on your Moto Guzzi motorcycle or other shaft drive motorcycle yet, hopefully this article will inspire you. The California has the old-school style Guzzi shaft drive. This consists of a drive shaft housing fastened to a gear case at the rear wheel that houses the ring and pinion gears. This is pretty much the same design that has been used for decades on Guzzis. I love designs that are well proven, and this is one of them. Fortunately, changing the gear oil is a lot easier than changing the engine oil on a stock Moto Guzzi California. On the rear gear case are 3 threaded plugs. The fill plug is at the top, the oil level plug is near the middle, and the drain plug is at the bottom. 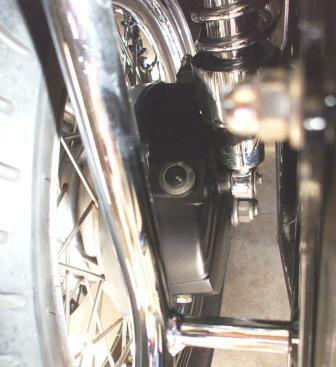 The middle (oil level) plug has a 17mm hex head and is positioned horizontally on the case towards the rear of the bike. 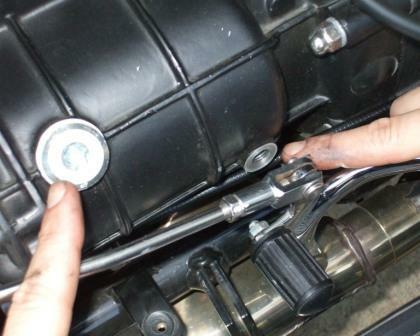 With the bike on the center stand or with someone holding it upright for you, have a rag ready and remove this plug using a 17mm wrench or socket. A very small amount of gear oil may begin to drip, but don’t worry because nothing much should come out. If a lot of oil pours out while the motorcycle is upright and level, then someone had really overfilled it on you. I hope you didn’t do that. The purpose of the middle plug hole is to allow excess gear oil to drain out when you fill it. This prevents you from overfilling. Rear wheel drive cars have a plug like this one on the differential (aka pumpkin) for the same purpose. Not too many people actually ever check or change the oil in their car’s rear differential, but if you have, I am sure you will remember the nasty smell of it as I do. 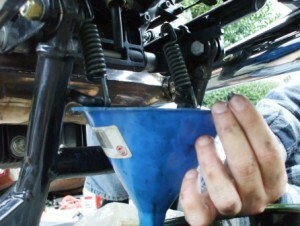 On your Moto Guzzi, don’t ignore the rear gear oil as you probably did with your old car or truck. If you do, you’ll be risking a very costly and potentially very dangerous gear failure on. The Guzzi rear gear case only takes 1/4 (.250) liter of oil, so changing it regularly is important and does not cost much to do so. The fill plugs on the gear case at the rear wheel and at the transmission have a female hex requiring a 10mm hex key. These have a black rubber insert pushed into the hex simply to keep water and dirt from collecting in it. The rubber stays in just by friction, so use your fingers or a small flat screwdriver to pull or gently pry the rubber insert out. The gear oil level inspection plugs and the drain plugs are both hex head type. You will need a 17mm socket and ratchet, or a 17mm wrench. By the way, a decent little tool for oil plugs on motorcycles is the 17mm Kastar oil plug wrench. It is slim, it ratchets and the head has an angle to it. It is also small enough to keep in a tool bag. Note: if you don’t have this little rubber insert in the top plug, that is fine except that the hex will get nasty inside and eventually you will have a hard time getting your 10mm wrench to fit into it due to dirt and corrosion. 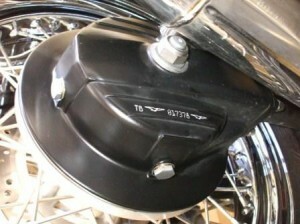 The Moto Guzzi part number for the rubber insert is GU93180245 and is available from a Guzzi dealer. To top-off the rear gear oil level, or the transmission oil level, just remove the top and middle plugs. The middle (oil level) plug on the transmission is located close to the rear brake heel peg, so you won’t be able to get a socket on it, but you can on the rear gear case. Have a rag ready at the middle plug opening and slowly add gear oil into the top plug hole until it starts to come out of the middle plug hole where you are ready to absorb the excess with your shop rag. Fasten the middle plug and the top plug, and push the rubber insert back into the top plug hex. Wipe off any residue on the rear gear case and check your wheel and tire to be sure they are oil free. 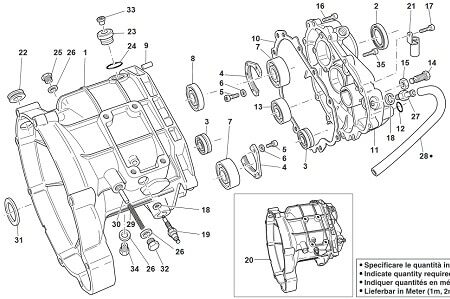 To change the rear gear oil, or the transmission oil, first remove the top plug as described above. Have a funnel and a container ready to collect the used oil. Second, open the bottom plug with your 17mm wrench or socket. A note about the transmission drain plug: There are actually two drain plugs on the late model California transmission case. Both have a 17mm hex head. The vertical one is the preferred drain, but is quite difficult to access without removing the mufflers and H-pipe, which I chose not to do. 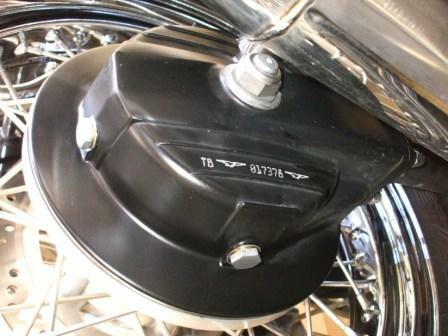 Some Cali owners switch to the round tube H-pipe just to gain access to this drain plug. Maybe having the proper tool would do the trick, which I admit I didn’t have yet when I did this. So, the second drain plug on the transmission makes things a lot easier. This one is horizontal and faces the rear wheel at the lower end of the transmission case. This plug has a magnet in it just like the vertical one, and just like the rear gear case drain plug. Some will argue this plug won’t drain as well as the bottom one. Once all the gear oil is drained, inspect and clean the drain plug and washer, then reinstall it. The drain and level plugs have a magnet that must be cleaned before reinstalling them. Remove the middle plug using the 17mm wrench or socket. Inspect and clean this plug and washer also. Have a rag ready and now you can slowly add your new gear oil until is starts to come out of the middle plug opening. Once it does, reinstall the middle plug and then the top plug. Push the rubber insert back into the top plug hex. Clean up any oil residue and you are done! The grade of gear oil specified for late model Moto Guzzi California motorcycles is SAE 80w-90. The Guzzi factory currently recommends Agip Rotra MP. This is an API GL-5 hypoid gear oil. Only because Agip oil is quite difficult to find in the US, I used a different brand of API GL-5 80w-90. Quantity is 3/4 (.750) liter for the transmission gearbox, and 1/4 (.250) liter for the rear drive. The rear drive lubricant recommendation is .230 liter Agip Rotra MP 80w-90 plus .020 liter of Agip Rocol ASO/R or Molykote tipo A. Oil brands are one of those often debated topics among gearheads. I think we all would like to know what brand works best, especially regarding the guys with over 100,000 miles on their Guzzi. Any suggestions about which brand of gear oil you believe works best in your Moto Guzzi? After every 3000 miles, according to various Moto Guzzi manuals, it is time to inspect the California air filter, and to change it after every 6000 miles. These are just a guideline, and as with any vehicle, this depends on your riding conditions. Just after reaching 20,000 miles on my 2007 Moto Guzzi California Vintage, the headlight finally burned out. I replaced it with a Philips MotoVision bulb that gives off an orange glow to help be seen in traffic. For my Moto Guzzi California Vintage, I had planned on installing flashing brake lights for a while. A car stopping quickly at the last minute behind me convinced me that I waited too long. Now I have red flashing LED brake lights in addition to my regular tail brake light. Thanks David, you are absolutely right! Corrections made. John, you have an error. You write that “The Guzzi rear gear case only takes 3/4 liter of oil”. It should take only 1/4 litre (250ml) of oil. I have a 1999 V11ev. Does it have the 2nd drain plug? Or, only the one with the catalytic converter/H pipe issue? just got a new 2009 white vintage, this site helps a lot with the basics, thanks! The manual suggets using 80w90 and also suggets using this for the final drive, but to include moly. I use an oil with the moly already added, and have been told by an expert that using it in the gerbox as well is an advantage. The trick is to make sure that the moly gets mixed properly as it settles to the bottom, and can be seen as a silvery sludge on the bottom of the bottle. I suggest giving it a good shake, do the gearbox, then do the diff and scrape out any and all of the moly seen, and add it to the diff.